Andhra Bank Recruitment 2016: Andhra Bank has depicted a job notification about Andhra Bank Recruitment. 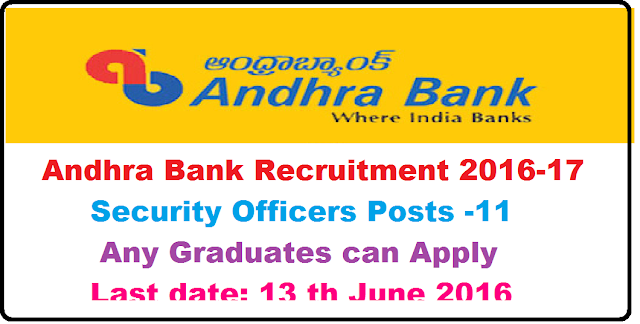 Andhra Bank a leading Public Sector Bank invites applications from Indian citizens for the Post of Security Officers in MMGS-III. Candidates who want to grab this post must apply for Andhra Bank Vacancy. The organization is inviting online application form from the career oriented and talented job hunters for filling up the reputed positions. Those applicants who have fulfilled the complete eligibility criteria may apply for Andhra Bank Jobs on or before the last date that is 13th June 2016. The entire details about Andhra Bank Recruitment are well mentioned below by the team of privatejobshub.in. Applicants who are willing to apply for this recruitment they must have done Graduation in any discipline from a Recognized University. The total emoluments inclusive of all allowances and Perquisites works out will be paid to apsirants of Rs. 11.48 lacs p.a. (approx) on cost to company basis. Applicants who are willing to apply for thius recruitment they will be selected on the basis of Interview. Candidate has to secure minimum marks of 40% in the interview to be eligible for selection. How to Apply for Andhra Bank online application form ? Applicants first of all visit the official website that is www.andhrabank.in. Then follow ‘Careers’ link given at the bottom of the home page then select the link of “Recruitment of Security Officers (MMGS III)”. Read complete advertisement properly and those who have fulfilled the eligibility criteria may download application format. Send the complete application form to below stated address before the closing date.